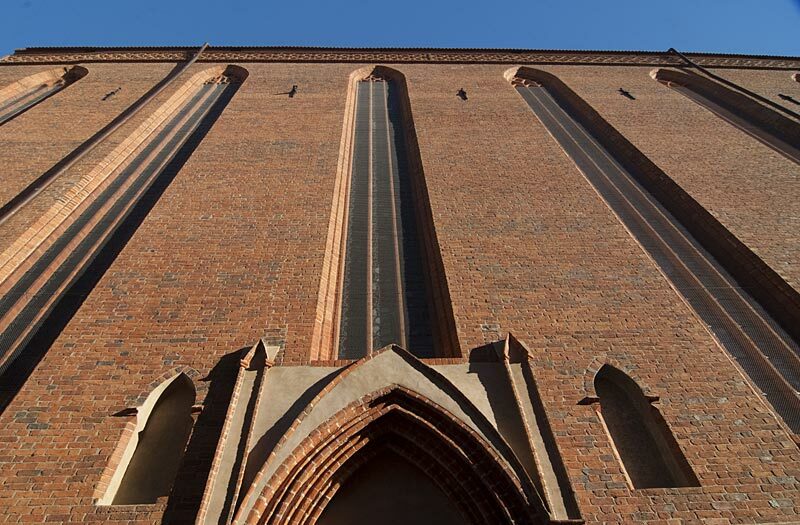 The Church of the Assumption of the Blessed Virgin Mary was erected in the second half of the 14th century by Franciscan friars, who arrived in Toruń just a few years after the city was founded in 1239. The well-preserved monumental Gothic edifice is the third, possibly the fourth, church built on this site. In accordance with the strict Franciscan rule, the building had no tower, but rather three small fléches facing the Old Town market square. To the north, the church bordered a friary which was pulled down in the 19th century. The demolition works threatened the construction of the church as its main outer wall began to lean and the structure had been additionally weakened by heavy damage sustained during the Napoleonic wars. The preventive measures taken at the right time saved from demise a church which still houses an abundance of invaluable masterpieces of art. Inside the church, of particular value are murals of saints painted in 1380s. Another precious feature are richly carved tall wooden stalls situated on both sides of the extensive presbytery. These benches were used by medieval monks, and from mid-16th century, after the church was taken over by Protestants, they seated the representatives of the Lutheran city council of Toruń. The church was the most important place of worship for the Evangelists of Toruń. They attached particular significance to preaching and common choral singing, it is little wonder then that the pulpit and organ, which date back to the early 17th century, were made with exceptional craftsmanship. The sound of the organ accompanied one of the most important ceremonies that have been held here, namely the funeral of the Swedish princess Anna Vasa, a sister of the Polish king Sigismund III Vasa, which took place in 1636. Her burial in Cracow was vehemently opposed by Catholic clergy as Anna Vasa was a Protestant and during her lifetime kept away from the royal court, residing permanently at the castles of Golub-Dobrzyń and Brodnica. Known as an avid protector of Lutheranism, patron of artists and benefactor of the poor, the princess was interested in botany and is claimed to have been the first person in Poland to grow and smoke tobacco. The Baroque grave slab, funded by the king Ladislas IV Vasa in 1636, is situated in her mausoleum which adjoins the north side of the presbytery. The church was also the burial place of numerous outstanding burghers and noblemen of Toruń, which can be seen from the Baroque and Renaissance epitaphs mounted on the walls and the grave slabs incorporated in the church floor, some of which date back to the Middle Ages. The Church of the Blessed Virgin Mary was returned to the Catholics in 1724, following religious riots known as the Tumult of Toruń. The church and the priory were then occupied for nearly a century by the Bernardine monks, who promptly built a Baroque high altar , the rood screen separating the presbytery from the nave and all the side altars preserved up to the present day. One of them, situated at the end of the south aisle, contains a painting of the suffering Jesus which used to belong to king John III Sobieski and is believed to have served as the field altar during the battle of Vienna in 1683. The abundance of furnishings and decor as well as the fascinating history of the church create a unique atmosphere which is additionally increased by the beams of light penetrating the the 19th-century stained glass windows.